As a lifelong skier in his native Switzerland he was well acquainted with the Olympics, of course, later reveling in the sight of the Utah Olympic Park ski jumps where his countryman, Simon Ammann, shocked the sports world with two gold medals in the 2002 Salt Lake Winter Games. Other than that, all he knew was that Utah was about as far as one could get geographically from his other positions as principal conductor of the BBC National Orchestra of Wales and chief conductor of the Nagoya Philharmonic Orchestra in Japan. 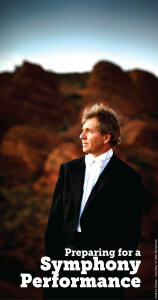 But then he became aware that the Utah Symphony was former Music Director Maurice Abravanel's legacy and that Utah offered vast, quality outdoor recreation. His interest piqued. 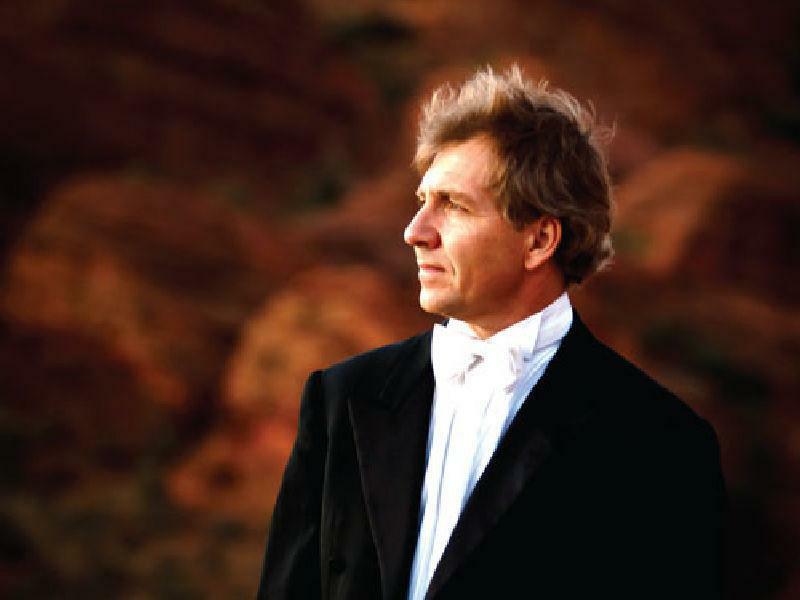 The more he talked to Utah Symphony | Utah Opera CEO Melia Tourangeau and other search committee members, the more he realized how much culture Salt Lake City had to offer and how much recreation the state presented, both very important to this renaissance man. "The ballet, the opera, I couldn't believe it was all here," Fischer said. It became clear that the state's support for the arts will underscore "the imagination and energy to develop my concepts." He added: "I saw phenomenal potential and a great willingness [by the orchestra] to work hard and to be the best. That's a tremendous motivation for a conductor." There was also great skiing, too, and myriad opportunities for summer adventure, something that appealed to his family, wife Catherine and three active sons. Of Ludwig van Beethoven's nine symphonies, the 6th in F Major and 7th in A Major offer an interesting contrast. The 6th, like its namesake, the "Pastoral", is pleasantly melodic. The 7th is dynamically vibrant.How does a world renowned conductor prepare to lead a full symphony orchestra in both these great works in two, back-to-back, nightly performances? The Fischer's chose the beautiful Red Mountain Resort & Spa in southern Utah to relax and prepare for this monumental undertaking preceding the performances at Dixie State College in St. George. 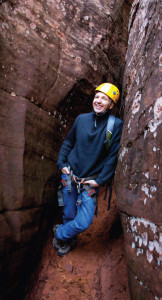 However, Fischer is also an athlete - a man with abounding energy and, as such, joined with Outdoor Utah staff and Zion Rock & Mountain Guides in a canyoneering adventure near majestic Zion National Park one sunny afternoon prior to his concert that evening. Growing up in Switzerland, the Fischer's are hikers, skiers, fit and athletic. But they have never been on a rope. 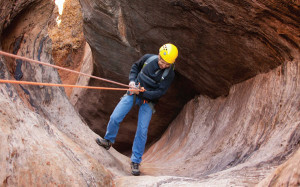 Rappelling off a cliff face for the first time will get anybody's attention, regardless of their physical and mental prowess. Apprehensive, yet excited Thierry and Catherine, joined by Utah Symphony Chief Operating Officer Dave Green and St. George CVB executive Kevin Lewis, meet up with Zion Rock guides Greg and Zach and head up the spectacular drive toward the Kolob Terrace section of Zion National Park. Just outside the park they arrive at the trailhead of Lamb's Knoll, aka Snake Alley. Due to Maestro Fischer's need to prepare for this evening's performance, we have a limited amount of time to assemble gear, harness up, instruct the anxious first-timers, hike up, descend two drops, negotiate a tight slot and hike out. 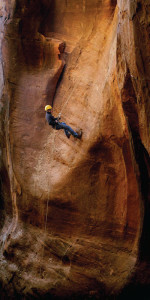 Dean Woods, owner of Zion Rock & Mountain Guides, has suggested this route for its relatively short distance and moderate difficulty rating. Yet all slot canyons are difficult, comparatively, and even more so to those who have never experienced one. Catherine is silent, particularly nervous, but a game trouper. The hike up is beautiful this southern Utah fall day, crisp air, azure sky, autumn colored foliage along the way. We arrive at the top, secure ropes, check rappel devices and prepare for the first drop, alternating experienced canyoneers with beginners. This is a great initial rap for first-timers. Not too long, straightforward entry, no overhang, bottom in sight. Thierry's drop is clean. He's a natural! Catherine, once over the edge and dropping, gains confidence. When on the canyon floor, they both exude the excitement of two energetic, competent athletes. The second drop around the corner is more difficult, but now they're pros. We complete the drop into a cavern and Catherine asks "Where do we go from here?" I point to a narrow, sinuous slot that appears from our vantage point to be no more than 10 -12 inches wide. "Where?" she exclaims! "How do we get through there?" In reality, it's wider than it appears, probably all of 18 inches. Although we all manage to scrape a few sandstone abrasions on packs, shirts and hiking pants, we all emerge unscathed out the slot and hike out to a welcome picnic lunch in Zion National Park's spectacular backyard. Completely energized from the day's adventure, that evening Thierry conducts the Utah Symphony in a masterful performance of two great Beethoven symphonies to an enthusiastic and appreciative audience. The culmination of a perfect Utah adventure/culture experience brought forth by Thierry Fischer. The man, the athlete, the Maestro.